Price shown for this country, excluding insurance, GST and other required fees. Please visit our Price List. The iconic L-shaped Daytime Running Lights compliment the LED headlights, so your vehicle is immediately recognisable as a Lexus. Rear seats slide, recline and fold virtually flat in a 60/40 split, while storage compartments are conveniently spread throughout the RX. Stylised tail lamps wrap around the RX’s deeply carved side panels, and light up in a glamorous display of illumination. More than just aesthetics, the sleek lines significantly improve the aerodynamics of the RX, and optimise fuel efficiency. Overseas model shown. The RX seats, based on an ergonomic design, put equal emphasis on comfort and accessibility. With the smart key on you, the car senses your arrival and conveniently unlocks the doors. The door handles even feature an illumination line allowing passengers to locate the door handle easily. Wide-angle cornering lamps provide additional illumination when you take corners, ensuring excellent pedestrian visibility. Compact and highly-rigid MacPherson struts and lower arms, used for the front suspension, ensure excellent vehicle stability and steering response. By combining an electric motor and a finely-tuned petrol engine, the RX 450h delivers extra power and instant torque. Fuel consumption is greatly reduced to 5.7 L/100km (combined)*, and all this without compromising performance. The meter displays real-time information about the hybrid system’s output and regeneration, encouraging you to adopt an eco-friendly driving style. The EV drive mode allows you to enjoy electric motor-only driving at low speeds. This is useful for quietly driving around residential areas at night and in the early morning, as well as emissions-free driving in slow moving traffic or low speed zones. Every drop goes a longer way with the D-4S engine, which delivers high performance, excellent fuel economy and low emissions. In the mood for a sportier drive? The Hybrid System Indicator changes to a tachometer when you select SPORT mode. A high strength, collision-absorbing body structure offers enhanced protection of passengers and the vehicle from impacts on the front, rear, sides and roof. The RX line also features the Lexus Safety System +. This technology includes Pre-Crash Safety System with Autonomous Emergency Braking and pedestrian detection, All Speed Dynamic Radar Cruise Control and Lane Keep Assist with Lane Departure Alert, Vehicle Sway Warning and Adaptive High-beam system. Lane Keeping Assist (LKA) uses specialised cameras to monitor the lane markings on the highway, notifying the driver if the vehicle begins to drift. LKA gently applies steering inputs through the Electric Power Steering (EPS) when the vehicle shows signs of departing from the centre of the current lane, assisting and prompting the driver to take action. The system is simply over-ridden should an actual lane change be required using normal steering force. The parking assist monitor accurately guides your parking attempts by superimposing projected parking lines on the back camera’s video feed. When low tyre pressure is detected, the multi-information display alerts you of the affected tyre with an in-meter warning lamp. Know when vehicles are approaching in your blind spot, even at higher speeds with the Blind Spot Monitor fitted with a radar that detects up to 60 meters. Overseas model shown. Collision impact is greatly reduced with 10 sensor-controlled airbags lining the cabin, providing enhanced protection for all occupants. * Your actual fuel consumption will vary from that shown, depending on factors such as vehicle condition and any vehicle modifications, driving style, traffic conditions, distance travelled and fuel price variations, Visit http://www.nzta.govt.nz/vehicles/vehicle-types/vehicle-classes-and-standards/environmental-standards/ for more information. 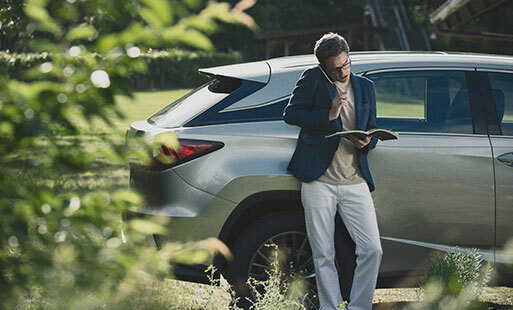 Drive with peace of mind, knowing that your Lexus vehicle comes with a four-year unlimited kilometer* warranty, supplemented by a six-year corrosion perforation warranty. Whether it’s a flat tyre or an empty tank, you can count on reliable assistance 24 hours a day with just one phone call. Be the first to get the latest updates and promotions on the RX 450h. We will update you the moment we have any promotions or updates for this model.